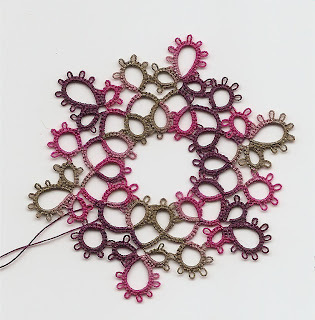 This is what I was tatting when the new threads arrived from Yarnplayer. It is the little motif from Blomqvist and Persson, done in King Tut and the very fine red silk. Here are the threads, but why oh why is it so difficult to capture the colours successfully? This isn't even close. This is the first thing I made, using the free gift of Tourmaline, another favourite pattern from the same book as above. 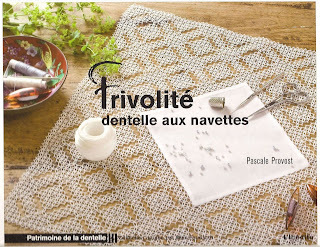 Then, while looking around Leclerc in Cahors I discovered that Pascal Provost had published a new tatting book. One of the patterns in it was actually called Tourmaline! Of course I had to buy it. This is just a quick try of one of the patterns, using up what was left on the shuttles...but not quite having enough! I didn't choose the Tourmaline pattern though. 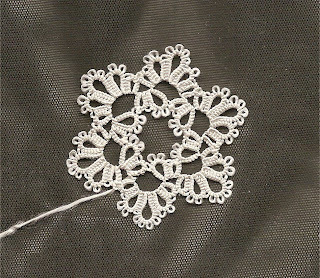 You remember this motif, which I made here in white silk? Well, I think it is a good one for showing off HDT, as it allows the gradations to move into each other, and also uses quite a lot of thread, so that you get to see the repeats. Why do I feel the need to apologise when I don't finish of the ends? Still it does spoil the image. I love all the colors you've chosen! Red silk... hmm... that's something my mom would love! I look forward to seeing the Tourmaline pattern tatted up! Diane, the silk is really fine, I had to increase the stitch count to make it fit in with the King Tut, if that gives you an idea. 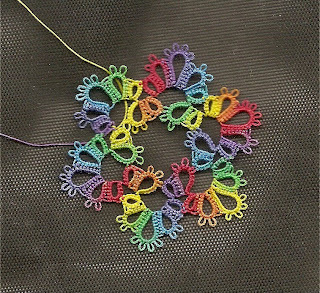 It's lovely thread, but a pain to count the stitches! I love everything you posted today! The motif's are so pretty and the colours are absolutely perfect. Oh, snowy these are all so pretty! 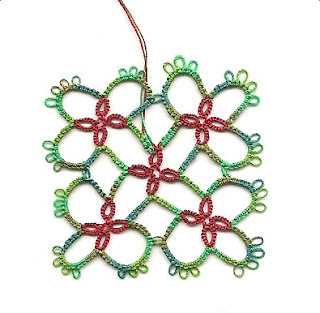 The colors and the patterns are all gorgeous! I'm celebrating my 2 year blogoversary! You are more than welcome to come and join in the fun if you would like! 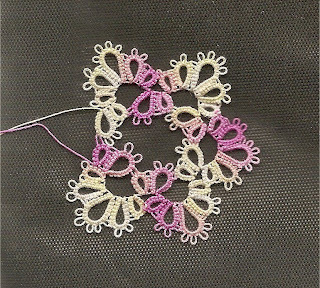 All your tatting is so beautiful. Wish i had that Mary Konior book. Still going to find the square and stumbled back to this page - My goodness, you are such a wonderful tatter!